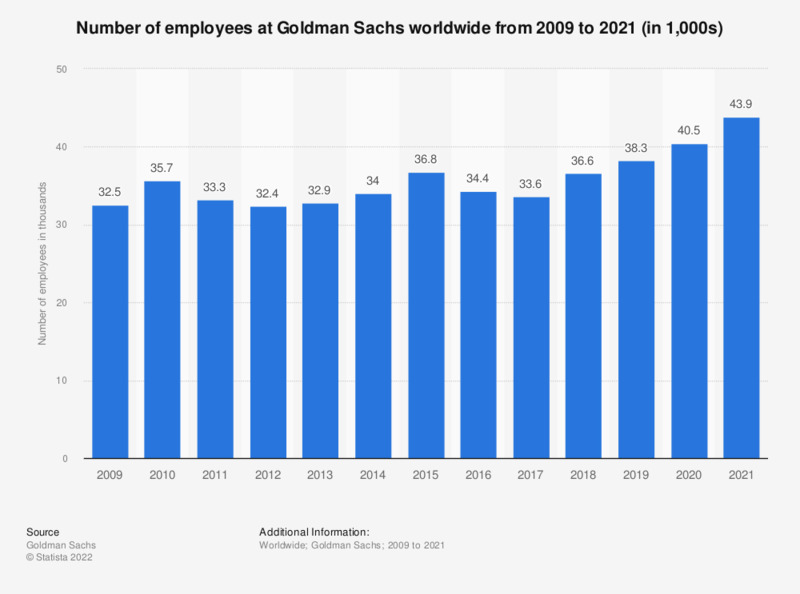 The statistic depicts the number of employees at Goldman Sachs worldwide from 2009 to 2018. There were 36.6 thousand employees at Goldman Sachs globally in 2018. The employment trend in global locations of Goldman Sachs has remained quite stable in recent years. Apart from 2010, 2015 and 2018 when the company employed over 35,000 people, the number of employees amounted to under 34 thousand each year. The employment level in all of the commercial banks insured by the Federal Deposit Insurance Corporation (FDIC) in the United States has risen over time. The number of jobs changed from 1.88 million in 2009 to 1.94 million in 2017. The increase in employment was not matched by an increase in number of banks. The number of FDIC-insured commercial banks in the United States decreased from 6,826 in 2009 to 4,909 in 2017. As far as the investment fund industry is concerned, the number of employees amounted to 178 thousand in 2017, exceeding the employment level observed in this sector before the financial crisis in 2008. The financial sector is one of the industries with lowest unemployment rates in the United States.